"DESCENDANTS of the indigenous people from the Warao Tribe yesterday staged a prayer ceremony to their ancestors as they called for constitutional rights and official recognition. The group met on what they claimed is sacred ground where they said their ancestors were buried in Banwari Trace, Penal. The ceremony, according to the Waraos also marked the beginning of a new era and not the end of the world, as some predicted would have happened yesterday following the end of the Mayan calendar. Chief Elder Lawrence Lloyd Gervais said the history of the Warao has been swept under the carpet. Waraos and other indigenous tribes from Rio Claro, Arima and other districts assembled at the holy grounds forming a circle and offering prayers to their various gods and ancestors. Elder Rabina Shar, said under the United Nation-declaration on the rights of indigenous people he wants the Warao to be recognised as a sovereign nation within Trinidad. “But this is a new sovereign nation we want the people of Trinidad and Tobago to recognise us as we are the first sovereign nation. And that our sovereignty would be recognised constitutionally,” Shar said. Shar said the cradle of the Warao civilisation is at the Naparima Hills where their first father had two children. At those hills the children were taught the foundation and tradition of the Warao. “This is not something written in a paper that a Judge or a lawyer could talk about. It is something that we live and respect in our hearts as a people,” Shar said. He said the Warao religion was taken over and indigenous people were divided. Shar claimed that attempts are being made to take away the sacred grounds which is part of their history. He said their sacred grounds was to be transformed into a national heritage site. But the group insists this land is holy and their ancestors’ bones lie buried beneath. “They can’t make this what they want it to be...no heritage site,” Shar said. In this new era — according to Warao traditional beliefs — he said the Warao, in addition to being recognised, want their holy sites across the country to be returned to them so the Elders can start projects to educate the youngsters, to keep the tribe together and ensure continuity. Shar explained that yesterday’s prayer ceremony is performed every 494 years to mark the end of eras of time. Young and old participated yesterday in the prayers. A bundle of pieces of wood was placed in the centre of the circle and a fire was lit. Pieces of dried tobacco leaves were placed in the fire by each member together with honey and rice. Fixing Banwari site 'a priority'. Assembly of first people in 2013. "Further recognition for the indigenous people of Trinidad is expected when the Ministry of National Diversity and Social Integration convenes its first National Assembly of Indigenous People in early 2013. The announcement was made yesterday by Minister Clifton De Coteau when he attended a special new year observance of the Warao people at the Banwari historical site, San Francique, Penal. "My ministry is working on several initiatives concerning the first people and, rest assured, I will be in touch with your organisation during the new year to formulate plans for the assembly," said the Minister. De Coteau said, "Government is giving priority to the continued development of the Banwari site and plans are under way to set up a management committee to speed up the project." De Coteau said he was happy that a contingent of supporters came from Arima to join in the Warao's spiritual exercise. Zachary Medina, grandson of a former Carib queen, took part in the spiritual exercise. He was accompanied by a number of young followers from Arima. Rabina Shar, spokesperson for the Warao tribe, said they were happy that the Minister was present. "It is the first time a Minister has attended such a programme at the Banwari site." Shar announced that early in the new year all the groups that comprise the first people will hold a national meeting to discuss the way forward. He performed the duties of a shamaan (high priest) by offering tobacco, rice, honey and other items to the Warao gods. After his offerings members of the public were invited to do likewise. Also attending the ceremony was Lawrence Lloyd Gervais, Grand Chief of the Warao tribe. I am so glad to see us all coming together. I had always wondered about the silence of the descendants of indigenous peoples in Trinidad and Tobago, apart from those represented by the Santa Rosa Carib Community. It is good to know that the Warao are speaking up about their relationship to this place. I have always been moved by the fact that it is an important part of their mythology and that even when they were located in Venezuela, they would make the pilgrimage to their sacred place at Naparima Hill in San Fernando - which they believed to be one of the pillars holding up the sky. 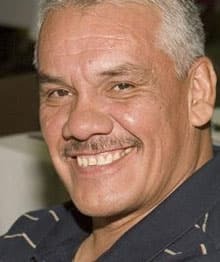 The following is a report produced by the South Western Peninsula of Warao Descendants First Nation of Trinidad and Tobago for the summary that elaborates the Office of the High Commission on Human Rights for the Universal Periodic Evaluation of the Bolivarian Republic of Venezuela. Address: 65 High Street Siparia, Trinidad and Tobago, W.I. 1. We are the elders of the South Western Peninsula of Warao Descendants, First Nation of Trinidad and Tobago, and are Warao Descendants in South Trinidad. Historically, we are in the Northern boundry of Warao Territory. The Southern boundry is in Karoshimo Mountain in the Bolivarian Republic of Venezuela. Seven thousand years now we have inhabited this territory and South America. Our first parents Habori and Wanta are believed to be the progenitors of all aboriginal tribes. the performance of our duty to maintain harmony with nature is ours world order. We are a Nation and not an organization, culture group or NGO. Our allegiance is to our people, our territorial habitat of Trinidad and Tobago, Venezuela and countries within South America. As Elders, we assume the role as protectors of Aboriginal people’s freedom as trustees within the territory. 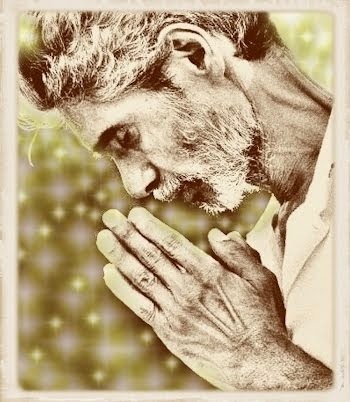 Our Earth Gods Wara Waro and Nabarima dwell in the Naparima San Fernando Hills where our progenitors found refuge in a Cave therein: and their spirit dwells. Our family in the Orinoco Delta used to do holy pilgrimages upon this hill until de 1950’s. We are the canoe people. Our travels throughout our world of South and Central America have exposed us to various cultures. Invasion of our territories by Spain, led to the enslavement of our people. This dispersed our people as some returned to the Orinoco and others remained in Trinidad and Tobago. Years of colonization have divorced us from the wisdom of our ancestors. We have been subjected to the growth of a new society of culture clashes as people from different parts of the world arrived on our shores. This led us the above mentioned Elders Council, to undertake objectives to educate and sensitize our people in order to identify themselves. We have, since then, stepped forward to unite the Nation. 2. Some objectives which could help our people to identify themselves with our brother and sisters worldwide are: - To research knowledge of our Ancestors with a view to find ourselves, educate our people and sensitize them towards their rights. - To register and organize our people with the Principle of “Freedom of Association” into an infrastructure of National operational Capability in order to address their needs. - Recognition as the first Nation of Trinidad and Tobago within the Constitution with a Ministry to address our affairs in Parliamentary Representation. - Trade and Cultural exchanges among our territory’s family in South American States. 3. 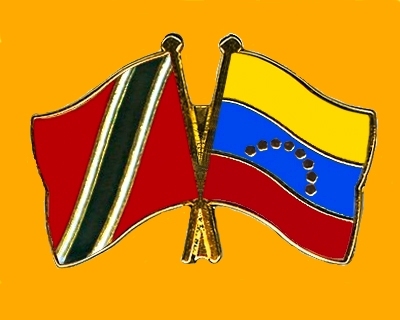 South Western Peninsula of Warao Descendants First Nation of Trinidad and Tobago uses this occasion with the Universal Periodic Review of Member States of the United Nations to present this written contribution to the Human Rights Commission of the United Nations on Venezuela. In particular, we hope that our experience will aide in exposing the condition of basic human rights in Venezuela. Our interest lie in the history of the Warao people whose habitat comprised both countries in respect to our territory. In the Republics recognition of first nation natives within their constitution; we are indeed pleased to recognize such veracity. In the eight articles inserted in the Bolivarian Constitution of Venezuela, the articles 120 and 125 appear to me as challenges. Article 120 seems to me, to be suggesting that the criteria of informing and consulting with our first nation people is enough to implement state’s exploitation of “our” natural resources. Our rights to consent or not appears to be indefinable. The word “Shall be carried out” implies the right of the state over the right of the native. Seven Thousand years of religious traditional and cultural habitation have preserved the natural resources that are our Gods, mother of the Forrest, mother of food, sacred grounds, sacred animals, sacred spirits, cosmology, and way of life. The Earth knows us; we know the Earth, we are one. To cut a tree requires a sacrifice. Actions that violate the natural order of harmony in nature are crimes of humanity. Justice lies within our hearts, not in Laws or their endorsements. Article 125 speaks of representation in the territories where native population control, in accordance with the law. 4. I recommend that Shamans and Elders of the Venezuelan Warao Community be part of the state’s executive rules and advisors in the administration of State development, planning and implementation. The advantages of your State lie within its Constitution and how its ideas are implemented and how positively the government has created a Ministry of Popular Power for Indigenous Peoples, to facilitate and promote the strengthening of the communal ancestral indigenous and respecting their values, principles and ancestral customs. 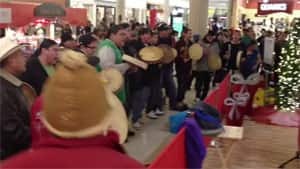 If you know nothing about the Idle No More Movement started in Canada, see this post for some background information. 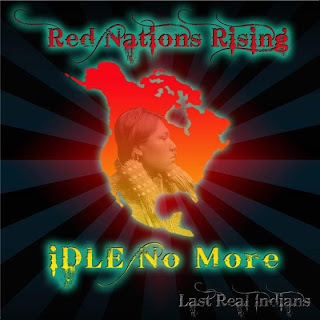 idle no more a song i wrote ! pass it on ! Where you spending your Christmas? What you miss about Christmas? What you cooking this yuletide Christmas morn? But it just don't feel like what we get back home. I miss Christmas in my land. [I coming home, I coming home, I coming home] I miss Christmas in my land. I coming home to spend Christmas in my land. What you doing for Christmas? Where you feting for Christmas? What parang you go sing this Christmas day? But they just don't sound like Queen Daisy Voisin. What you drinking for Christmas? What you eating for Christmas? Make any punch-a-crema yet this year? Well here's a present to make you glad - sweet soca sounds from the Caribbean. Sunshine Santa, Sunshine Santa from the Caribbean. Friendly people, that's what you'll find waiting here just to welcome you. Sunshine Santa Sunshine Santa from the Caribbean. ------ all the Christmas will be sweeter, I'll make your every wish come true. Thank you, Bindley B. I want to dedicate this song to Santas everywhere and I am referring to those people among our family members and friends who just know how to make Christmas special for those around them, I also want to share this with those of us away from our homeland who are already buried under snow. Sunshine and warmth would be a welcome change but this song goes a long way toward brightening up the season. But same thing my ------- wife have me doing. The woman tell me, "Sew the curtain, sew the curtain, sew the curtain"
She tell me, "Sweep the yard and sweep the yard and sweep the yard and..."
She tell me, "Paint the house and paint the house and paint the house and..."
She tell me, "Cut the grass and cut the grass and cut the grass and..."
I tell she, "Girl, give me a break! Woman, I need to rest!" And she tell me "Sew the curtain, sew the curtain, sew the curtain"
Man, I fed up do Christmas chores! Man, I fed up sweat and get wet! She say, "Boy what you doing here?... but anyway help me put this over the front door." She tell me "Sew the curtain, sew the curtain, sew the curtain"
Big smile on Granny face when she ------ see me. Mih Granny tell mih "Sew the curtain, sew the curtain, sew the curtain"
"I swear I have too much Christmas chores on mih plate." ------- tell mih, "Sew the curtain, sew the curtain, sew the curtain"
He tell me, "Sweep the yard and sweep the yard and sweep the yard and..."
He tell me, "Paint the house and paint the house and paint the house and..."
He tell me, "Cut the grass and cut the grass and cut the grass and..."
I feeling so alone, is best I go home. Thank you, J Square. I could work up a sweat just listening to your litany of chores. This song captures the bustle, sometimes approaching frenzy, of our preparations for Christmas. Wonderful, wonderful energy! Love is the word but the action stronger. [Is Christmas again!] Ey! Look, parang done start, oh gosh, ah catch the fever. Ey! Is Christmas again, is Christmas again! Come sing the refrain, is Christmas again! Ey, don't forget to buy Mammy something. [Is Christmas again!] Ey! And if you doh drink rum, no scene, there's plenty sorrel. Ey! Come sing de refrain, is Christmas again! Keep Christ in the thing 'cause that is the reason. [Is Christmas again!] Ey! Strike up a Christmas song and leh we sing together. Ey! Attawapiskat Chief Spence says not “afraid to die” as she launches hunger strike. 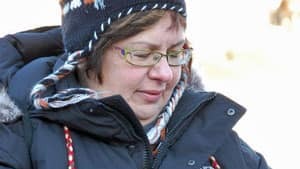 OTTAWA--"Attawapiskat Chief Theresa Spence stood at the steps leading up to the Peace Tower on Parliament Hill Monday and said she was “willing to die” if the federal government ignored her call for a meeting between Prime Minister Stephen Harper, Queen Elizabeth II and First Nations leaders. Spence plans to begin her hunger strike Tuesday morning after a sunrise ceremony on Victoria Island, just up the Ottawa River from Parliament Hill. “I am willing to die for my people, the pain is too much,” said Spence. “Somebody asked me if I was afraid to die. No, I am not afraid to die, it’s a journey we have to go on and I will go and I am looking forward to it.” Spence told reporters who had gathered for her small press conference that the Canadian government was ignoring the treaties and that the Crown, in whose name the treaties were signed, is ignoring the breakdown of the relationship. She wants the prime minister, the Queen, or a representative, to sit down with First Nations leaders and reestablish the treaty relationship. “I want the Crown, the prime minister and all the leaders to sit down and rebuild that relationship and honour and protect the treaty,” said Spence. The British, and later Canada, signed numerous treaties across the country and First Nations hold those treaties as defining their relationship with the Crown that predates the creation of Canada. A meeting was held last January dubbed the Crown-First Nations gathering and it was attended by the prime minister and Gov.-Gen. David Johnston along with First Nations leaders. Spence said the meeting was a failure because the Harper government didn’t change its approach to First Nations. Spence’s community of Attawapiskat burst onto the national consciousness last fall after images of the community’s deplorable housing flashed across the country’s television screens. The Harper government, however, attacked the community, blaming the band for its housing situation. Aboriginal Affairs Minister John Duncan took away the band’s control over its finances and imposed a third-party manager. Spence said her community was still in a housing crisis with people living in sheds and trailers. In an open letter released early Monday, Spence said she decided to go on a hunger strike after “months” of consideration and meetings with elders. “After a long period of reflection, the time is at hand for a clear statement,” wrote Spence. Spence wrote that the Canadian government was trying to “isolate” and “assimilate” First Nations people. “This process of marginalizing our political leadership, along with the enforced segregation of our people is part of a deliberate (attempt) to isolate our people, marginalize our people and ultimately assimilate our people so that our rich heritage can be wiped out and the great bounty contained in our traditional lands be made available for exploitation by large multi-national companies,” wrote Spence. Attawapiskat chief's hunger strike part of wider movement. Grassroots movement Idle No More driven by social media. Chief Spence exclusive interview with CBC News. "As Attawapiskat Chief Theresa Spence continues her hunger strike on Parliament Hill in an attempt to get a meeting with Prime Minister Stephen Harper, a grassroots protest movement of First Nations activists across Canada has united on social media and at public rallies. Idle No More's supporters say they are upset about the effects of the Harper government's policies on their communities. They want First Nations to be recognized as sovereign stakeholders in decisions affecting the country's land and resources. Spence’s hunger strike underscores that wish. Now, after more than a week without eating, concern is mounting about her health as she protests what she sees as a lack of respect for the treaty rights of First Nations. Mushkegowuk Grand Chief Stan Louttit has been keeping a close eye on developments with Spence. Louttit said leaders and communities across the country are uniting in protest in a way he has not seen in the past. “They can all relate to the fact that communities are in despair,” he said. Louttit said Spence's protest shows a long-standing fight over treaty rights has come to a head. “The government does not want to talk about the treaty,” he said. Attawapiskat is covered by Treaty No. 9. Author and Nipissing University Prof. John Long, who has written a book about the treaty, said there is conflict due to interpretation. “Virtually every treaty has this built-in contradiction,” he said. 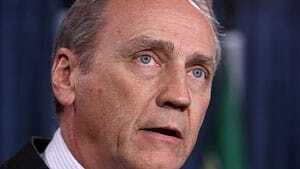 Aboriginal Affairs Minister John Duncan told a CBC reporter last week that the rallies are a result of social media. "We'll just have to see where that goes," he said. Duncan proposed a meeting with Spence to discuss issues affecting Attawapiskat, but there was no response. Quebec City-based writer and activist Nora Loreto recently blogged, "Idle No More has reminded me that there exists massive gulfs between people, experiences and awareness." She claims there’s been an “effective media blackout” on the cause. “After an aggressive social media campaign, flash mobs, rallies, blockades, co-ordinated actions, letters of support from national unions and a hunger strike, the media coverage has still been significantly lacking,” she said. The campaign was started by four women from Saskatchewan who were protesting against a number of bills before Parliament. They are particularly critical of Bill C-45, the government's omnibus budget legislation, which they say weakens environmental laws. "There are many examples of other countries moving towards sustainability, and we must demand sustainable development as well," says a manifesto published on the group's website, idlenomore.com. "We believe in healthy, just, equitable and sustainable communities and have a vision and plan of how to build them." Louttit is concerned that Spence’s quest to bring this message to Canada’s top leaders is heading down an unhealthy path, however. “She's a mother and a grandmother and there's a lot of people, I think, that are worried about her,” he said. The federal opposition parties and the head of the Assembly of First Nations have urged Harper to take steps to end the hunger strike. In a letter to Harper, NDP Leader Tom Mulcair called on the prime minister and the Governor General to meet with aboriginal leaders to end the protests. "I ask that you please act swiftly to avoid a personal tragedy for Chief Spence," Mulcair wrote. "I look forward to your early positive response to this urgent matter." Spence has been living in a teepee on Victoria Island in the Ottawa River, less than a kilometre from Parliament Hill, since beginning her fast Dec. 11. Victoria Island is considered by the Anishinabe as traditional territory. New Democrat MP Paul Dewar visited Spence on the island Tuesday and reported that she is so far in good health. Harper met with Assembly of First Nations Chief Shawn Atleo as recently as Nov. 28 to review progress the government has been making in addressing aboriginal issues, said spokeswoman Julie Vaux. "The prime minister hosted an historic gathering of the Crown and First Nations this past January," Vaux said in an email. The Liberals and the Assembly of First Nations also sent letters Tuesday to Harper and Gov. Gen. David Johnston, calling for an urgent meeting to discuss Spence's demands. The End Of The World, or the World As We Know It? I usually do not pay much attention to claims that the world will end on a certain date but I have to admit that I am more than a little curious about this Friday, the 21st December, when the Mayan Long Count Calendar runs out. Between this date and the 23rd December, time will have reached the end of a cycle of 394 years known as a baktun. This period will mark the ending of the thirteenth baktun and contrary to the expectations of some, I expect that we will be around to see the beginning of the 14th. It will not be the end of the world but a resetting of the calendar as it begins a new baktun, part of a larger cycle [pictun]. There are, however, many who really do believe that an Apocalypse will occur on this day. People all over the planet are making preparations either for termination of life or for survival in a post Armageddon world. All over the world, from China to France, many people are taking this very seriously. Those who are not believers are either blissfully unaware or confidently attribute the hysteria to the hype that has been encouraged over time by several publications and movies and those hoping to profit in some way. Another reason why this calendar resetting has been associated with Apocalypse is because it will coincide with a winter solstice where the sun will align with the center of the Milky Way for the first time in 26,000 years. Along with the Vatican astronomer, there are many Mayans who do not agree with this interpretation of their calendar. They see the date for what it is - simply a resetting, and maybe also a heralding of a rebirth for humanity rather than Armageddon and annihilation. I am going with rebirth because I am not afraid of death and there is that little matter of the garlic and seed that I have already planted in the ground that demand that there be a next year and the renewal of Spring. I must admit though, that of late, every time I am having a glass of my favourite beer, La Fin Du Monde, I smile to myself in appreciation of both the taste and the appropriateness of the name. See you on the next side! Canadian First Nations: "Idle No More"
Have you heard about the Canadian "Idle No More" movement. It is "calling on all people to join in a revolution which honors and fulfills Indigenous sovereignty which protects the land and water." "Colonization continues through attacks to Indigenous rights and damage to the land and water. We must repair these violations, live the spirit and intent of the treaty relationship, work towards justice in action, and protect Mother Earth." "Idle No More began with 4 women, Nina Wilson, Sheelah Mclean, Sylvia McAdam and Jessica Gordon, sharing a vision of bringing together all people to ensure we create ways of protecting Mother Earth, her lands, waters and people. The women began discussing the possible impacts that some of the legislation would carry if people do not do something. It became very evident that the women MUST do something about the colonial, unilateral and paternalistic legislation being pushed through the Government of Canada’s parliamentary system. They began with a piece of legislation called Bill C-45 which attacked the land base reserved for Indigenous people. The women decided that they would call a rally to inform the public that this bill intended to, without consent give the minister of indian affairs power to surrender the lands reserved. They felt that this would ultimately make room for oil, nuclear and gas industries to tear up the land for profit. From this rally they also informed the public on other legislation that affected and ignored the treaties made with the crown but also the waters, land and people that it would impact in very harmful ways. - Stand up and speak up against undemocratic and internationally illegal government acts. These rallies took place all across the country. The women seen that there were many other communities that needed to come together in an act solidarity and resurgence to assert their inherent rights as a sovereign Nation, thus The National Day of Solidarity and Resurgence was called for December 10, 2012. This was an enormous event that never in history seen many nations and diverse groups of people come together. These events and acts have continued to grow and from the talk of grassroots has no intention of slowing down. The group called Idle No More have witnessed these events spreading out internationally within the United States as well as the United Kingdom sharing in helping to support our cause of opposing the government’s actions as well as support to asserting our Nationhood. There are many examples of other countries moving towards sustainability, and we must demand sustainable development as well. We believe in healthy, just, equitable and sustainable communities and have a vision and plan of how to build them. Please join us in creating this vision. Idle No More Is Not Just an "Indian Thing." "What is "Idle No More"? It is a loosely knit political movement encompassing rallies drawing thousands of people across dozens of cities, road blocks, a shoving match on Parliament hill between Chiefs and mounties and one high profile hunger strike. It is also a meme tweeted and shared about thousands of times a day, for messages about indigenous rights, indigenous culture and cheap indigenous jokes ("Turn off your ignition #idlenomore"). The name Idle No More comes from Alberta. A few weeks back Sylvia McAdam and three other female lawyers were mad about Bill C-45, the omnibus budget bill. Their biggest frustration was that nobody seemed to be talking about it. Two provisions in particular upset them: the reduction in the amount of federally protected waterways and a fast tracked process to surrender reserve lands. In McAdam's view, if Aboriginal people did not speak out it would mean they "comply with [their] silence." So she and her friends decided to speak out. They would be "Idle No More." They held an information session under the same name. Co-organizer Tanya Kappo fired off a tweet with the hashtag "#IdleNoMore." #IdleNoMore struck a nerve. Though bill C-45 has become law, many of Aboriginal people have voiced their opposition to it. Many of the other tensions in the indigenous community has started to bubble up to the surface and "Idle No More" now encompasses a broad conversation calling for recognition of treaty rights, revitalization of indigenous cultures and an end to legislation imposed without meaningful consultation. To me this conversation is more than just an "Indian Thing." It is one that Canadians of all backgrounds should pay attention to, if not participate in. The ideals that are underlying this action are ones to which we all aspire, even if we may disagree on how exactly to pursue them. When Grand Chief Derek Nepinak went on national television after he and some other leaders got into that shoving match outside the chamber, he acknowledged the Chiefs were responding to young people calling for action via social media. At the rallies held in cities like Winnipeg, Windsor and Edmonton, it has been the youth who have done the organizing, and it has been the youth who have made up the majority of attendees. 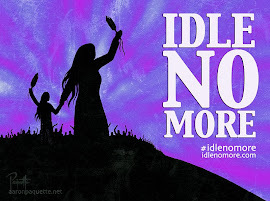 Scanning Facebook and Twitter, "#IdleNoMore" has popped up in the timelines of people who typically discuss Snookie or the Kardashians. Agree or disagree with the message, Idle No More has accomplished something all Canadians want: it has young people paying attention to politics. Much of the talk around Idle No More is about preserving indigenous culture, either by revitalizing spiritual practices, or by keeping intact what little land base we have left. The reason culture is so important is that it provides a way to grapple with the big questions in life: "Who am I?," "What am I doing here?" and "What happens after I die?" Some of the answers have been handed down as words of wisdom. Other times, you are told to go out on to the land and discover them for yourself through fasting or prayer. We need these ways. As I look around and see many fellow Canadians searching for meaning in their own lives, I think to myself perhaps they could use these ways as well. What almost everyone carrying the Idle No More banner is calling for is meaningful consultation between the federal government and First Nations people. This is what section 35 of our constitution is all about: Aboriginal and treaty rights are recognized and affirmed, and that means we have to talk. If there is no meaningful conversation happening, it is troublesome. Aboriginal people may be the canary in the coal mine. If we overlook one section of the constitution does that mean others are in similar jeopardy? Idle No More started in part because of outrage that Bill C-45 reduced the number of federally protected waterways. The environment continues to be a regular topic at Idle No More protests. Dr. Pam Palmater, one of the leading voices in the Idle No More conversation, argues this is indigenous environmentalism is significant since the crown has a duty to consult with Aboriginal people before natural resource projects proceed. She says, "First Nations are Canadians' last, best hope of protecting the land, water, sky and plants and animals for their future generations as well." Saying, "Get up and meet the day!" 'Cause I know there is no other way. Saying, "Come on, come on! Stand up for your rights!" You'd better listen to your tribal voice! You'd better listen to your tribal voice. 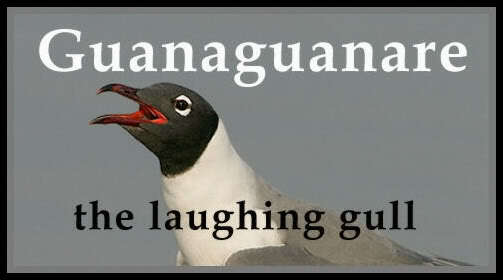 Gumatj! You'd better listen to your tribal voice. Rirratjingu! You'd better listen to your tribal voice. Wangurri! You'd better listen to your tribal voice. Djapu! You better listen to your tribal voice. Dhalwangu! You'd better listen to your tribal voice. Ngaymil! You'd better listen to your tribal voice. Dattwuy! You better listen to your tribal voice. Galpu! "Man may disappear. Man will disappear but the land will always be here. We are only the guardians of the land. This is our belief." No, I am alive! Life is mine! I will be defeated! I will die! No, I take back my life! Life is mine! In your ranks! Hold fast! Into the shining sun! Otra Vez... ¡Gloria Al Bravo Pueblo! "With all votes counted to the point of results being irreversible, the United Socialist Party of Venezuela has won 20 states, and the opposition coalition, three states. Venezuela Presidente Chávez Frías: "I Have Always Thought That We Live In Miracle..."
This win is quite an achievement especially as the elections were overshadowed by the president's serious health problems and there was only about a 53% voter turnout, lower than that for the presidential elections in October. Congratulations to the President and the people of Venezuela. As I plan for Spring planting, I have been reviewing the Veseys online catalogue. Looking through the section on growing products, I came across these items made from coconut fibre or coir and I wondered if we are already making these products for which there is apparently a growing demand internationally. We don't have peat but we certainly have coconut fibre and I expect that we will have much more at our disposal when the coconut industry is flourishing once more. Coir fiber grow strips, coir fiber grow pots and coir fiber grow pellets. Serenarte a la gente, bailen las mujeres. Del niño dios [parranda] - El Nacimiento. Cantando con alegría y emoción. ¡Nuestra tradición nuestra tradición, nuestra tradición!